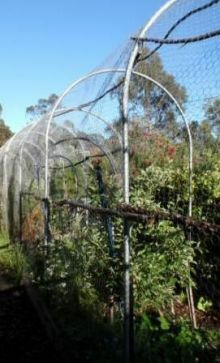 Wildlife (birds, possums, bats, reptiles) can become entangled in loose or poorly installed netting. Proper installation of netting over backyard fruit trees and vegetable gardens could mean the difference between life and death for our local wildlife. Thin nylon/monofilament netting should NEVER be used. Even stretched tightly over a frame wildlife can still become entangled and suffer appalling injuries often resulting in death. Whichever way you protect your fruit, please check your trees daily. If, despite precautions, any wildlife is entangled, do not attempt to release it yourself. 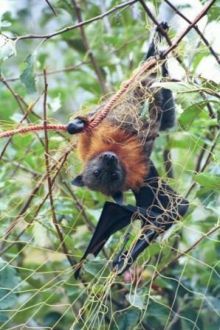 Contact your nearest animal rescue organisation Do not attempt to release them yourself – in particular, bats should be handled only by trained, vaccinated personnel. 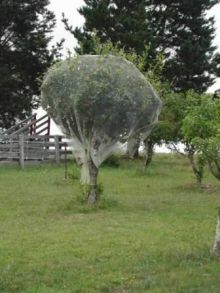 A single tree can be netted, with the fabric pulled tight. 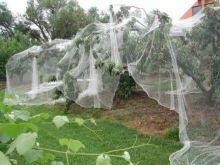 A vegetable garden bed or orchard can be covered with walk-through netting. Loosely netted trees like this can trap wildlife . .